With this timeless combination of style and touring function you don't just ride through the landscape, you're the most majestic part of the scenery.Even your eyes can't stop wandering on this machine. The Road King® is where stripped down, nostalgic style meets the performance and versatility of a modern Harley-Davidson® touring machine. The Hiawatha headlamp and nacelle were born in the 1960's, when chrome ruled the streets. But the power of the all-new Milwaukee-Eight® 107 engine brings it all into the here and now in a hurry. The all-new double bending valve front suspension and rear emulsion shocks put you in control for a plush ride. 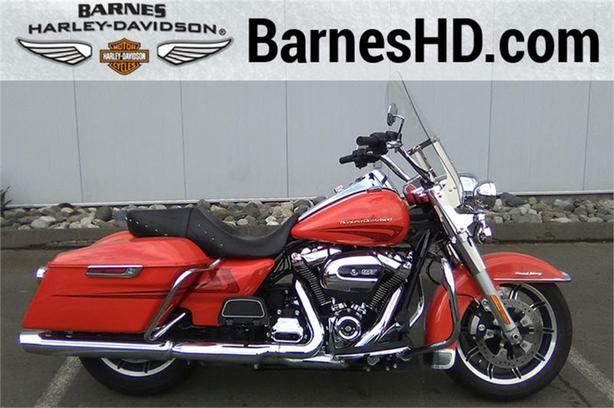 With cast aluminum Impeller wheels and one-touch opening saddlebags, this is the timeless classic built for today.